Most people know how to set SMART goals. The challenge comes in creating and following a plan to make those goals a reality. During the initial days of setting a goal, enthusiasm drives motivation to achieve results, but it isn’t long before it’s life as usual and the goal is a distant memory. Research suggests that less than 10 percent of people feel they achieve their goals. That means 90 percent don't, which is a staggering number. The question is what do the 10 percent do that the 90 percent don't? There are many factors that go into whether or not goals are reached, but two important components are 1) a plan, and 2) commitment to work the plan. If you’re ready to realize your goals, here's how to create a plan. 1. Make Sure Your Goals Are SMART. Specific: Your goal is clearly defined. “I want to make more money,” is vague. “I want to make $10,000 per month,” is specific. Measurable: You need to quantify your goal so you know you achieved it. This is where being specific helps. What constitutes "more" in more money? A specific dollar amount is measurable. Attainable: It’s good to set goals that make you stretch and challenge yourself, but you set yourself up for frustration and failure if your goal is impossible. Relevant: Your goals should fit within your ultimate plans in life. Time: You’ve set a date by which your goal will be achieved. 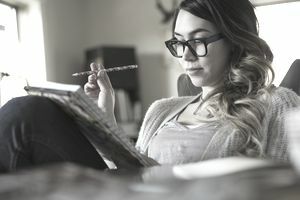 Note that goals work for large achievements, such as make $50,000 per year working at home, but also, for smaller projects, such as start blog in 30 days, or get five freelance clients in two weeks. 2. Work Backwards to Set Milestones. A challenge to reaching goals is that often the due date is so far away that many people put off taking action until it’s too late. Instead, looking at the amount of time you have and the goal you want to reach, create mini-goals that move you toward the big goal. For example, if it’s your goal to make $10,000 a month in your business within six months, create mini-goals of how much you’ll earn at the end of one month (i.e. $2,000/mo) and three months (i.e. $5,000 per month). You’ll know you’re on or off track when one and three months comes and you’ve hit or missed your mini-goal. 3. Determine What Needs to Happen to Reach Your Goals. During this step, get specific on what it takes to reach your mini and big goals within the time frame. Using the $10,000 a month goal example, to make more money, you need to get more clients or customers. In this step, you want to determine how many clients you need to make $5,000 and $10,000 per month in your business. How many prospects need to enter your sales funnel? How many pitches need to be made to generate a sale? 4. Decide What Actions Are Required to Reach Your Goals. What tasks do you need to do regularly to fulfill #3 and your goal? For example, if you need to talk to 10 people to make two sales, what actions do you need to take to find 10 people? If you need to have 100 leads to find 10 people to talk to, what actions will it take to find 100 leads? In business, the tasks in this section usually involve marketing; however, it also involves providing a quality product or service and keeping your customers and clients happy so they’ll keep coming back and/or refer new prospects. 5. Put Your Actions Into a Schedule. When you complete #4, you should have a list of tasks that need to be completed to reach your goal. Now it’s time to put those tasks into your schedule by making a daily plan. These are the tasks you do each day to generate prospects and leads. They are also the tasks you do to create and deliver your product or service. If you’re starting a part-time business around an already busy life, it can be a challenge to add more tasks to your daily routine, but it’s crucial to achieving your goals. One way to make it all work is to learn how to manage and maximize your time. Once you’ve completed the above steps, you should have your daily schedule and targets to shoot for during the process of working on your goal. The next step is to follow your schedule. Do the daily tasks you’ve assigned yourself to do. When you feel like things aren't going well, find a way to keep yourself motivated. That seems like a no-brainer, and yet most people don’t achieve their goals because they don’t do the work on a regular and consistent basis. In most cases, the plan doesn't fail, people simply quit. While you're at it, keep track of your accomplishments and results. Set aside time every month or so to evaluate how well your plan is working, and tweak it if you're not make the progress you want. The true test of whether or not you'll succeed in your home business is not only by having a good plan, but working your plan. Many would-be entrepreneurs get the point that they have a plan, but then give up on it. The answer is to get excited about your goals, build in ways to celebrate the small successes, and always keep your eye on the prize.